Turbulent night. Up for brisk walk round deck (too dodgy to run.) Discover from pipe that clock has moved forward an hour. Not much time for breakfast. Really trying for smaller portions, having been disgusted at current photos of me rounding out. 9am bridge visit, all too brief; makes me appreciate the ships I’ve been on that have had an open bridge policy. I’m sharking for gash charts to make gift books out of…mmm…haven’t yet found the right person to ask. Bookbinding fingers are itching. Outside it’s snowing and the water is moving about a lot. Have learnt of two professional blows in the last twenty-four hours – one disadvantage of almost instant e-mail contact all the way down here. One piece of work broken; one commission cancelled. Shut myself in lecture room and sing every song I can think of. Sounds weak and wavery but serves to sort my head out. Particularly in view of impending proximity, I doubt my capacity to respond calmly, not impetuously. Rick and Tudor empathise over marinated fish of various descriptions and give good advice; we all linger in the dining room. Sleep for an hour. Woken by the pipe announcing Shag Rocks; stark triangular silhouettes on the horizon. Oh but look! The first iceberg! It glows almost neon amidst the grey, superbly sculptural all by itself. Watch the wake, bluer now. Everyone excited to see a Giant White Petrel, very rare. It arcs and swoops with the rest of them. Information-loaded lecture on ice and glaciers from Uli. Oooh I love all that physical geography stuff; diagrams and arrows… First sitting of dinner with some of the expedition staff. We talk about the importance of celebrating Christmas on board and the merits of ice-cream over cheesecake. (They’re right about the cheesecake. They know.) Quick turn round the deck. Two fur seals writhing. Write. Tidy cabin. Meet the others after second sitting. Desultory chat about the lethargy of days at sea, underwear and filmmaking. 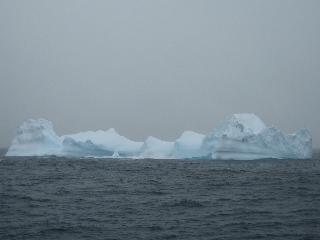 Because we’re now in iceberg territory, the Nordnorge switches on a powerful beam that sweeps the dark waves ahead. Someone on the bridge will be concentrating very hard tonight. Last thing up to the forward bar on deck seven to see the light picking out crests and growlers and wings.